In a previous corrosion properties post we began a salt water immersion test – explaining results for the first and second month would be coming soon. All specimens were placed in a tank of slightly agitated salt water at room temperature. All specimens were weighed and micrographed before the test began and after each month. Micrographs of specimen surfaces before immersion test, after 1 month, and after 2 months at 50x magnification. There are no significant signs of corrosion. In general, there are no significant signs of corrosion or overall uniform attack on the Liquidmetal alloy specimens. We did observe some rounding of previously more pronounced/sharp topography and we could also see some pitting, though sparse. No visible signs of corrosion could be seen on the stainless steel or titanium specimens either. We may exchange these specimens for thin polished plates instead since we would prefer to have comparable specimen geometries and surface finishes. 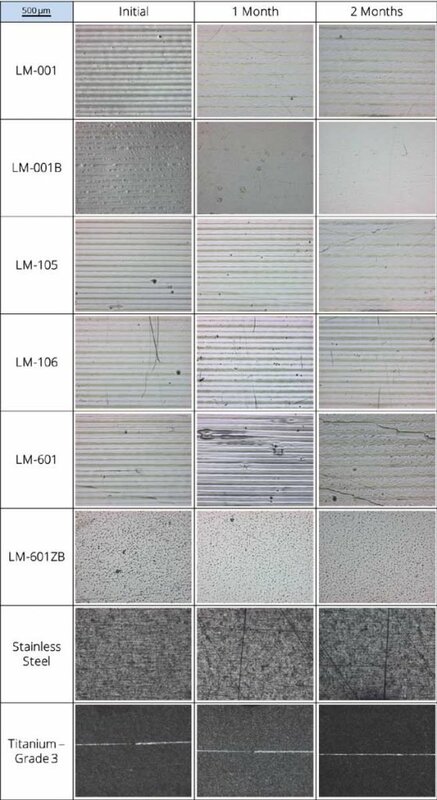 The cumulative mass loss after two months was insignificant for all specimens, except for LM-601 and LM601-ZB which had measurable quantities of mass loss, 0.03% & 0.02%, respectively. Based on these results, we decided to stop the test and set-up a more controlled corrosion test (according to ASTM G31). Therefore, coming soon…immersion corrosion tests of Liquidmetal alloys in chemical solutions! We’re working on an in-house set-up to test the alloys in more corrosive environments. For now, we are planning on seawater, hydrochloric acid, sulfuric acid, nitric acid, and sodium hydroxide at room and elevated temperatures.